Busy Bees Patchwork: The programme is on the press. 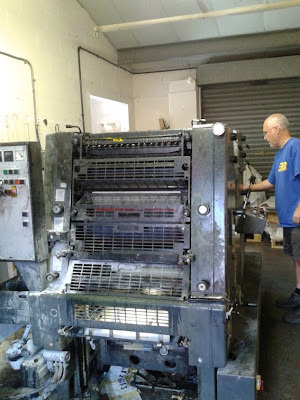 The programme is on the press. Roger started printing the programme this morning after problems with machines breaking down because of the hot weather. All went well today and the programme, which takes around four days to print and put together, will (hopefully) be out on time. Come along to Duffryn Community Centre between 10am to 4pm this Saturday, 20th July to pick up your copy of the programme and decide which classes you would like to do. I hope you will find lots to do and enjoy. last year you emailed it out. Aren't you doing that this year??? Sorry no, the price of postage is so high that we really can't . The programme is on line and if you do want a programme through the post just send us a SAE and we will happily pop one in the post for you.